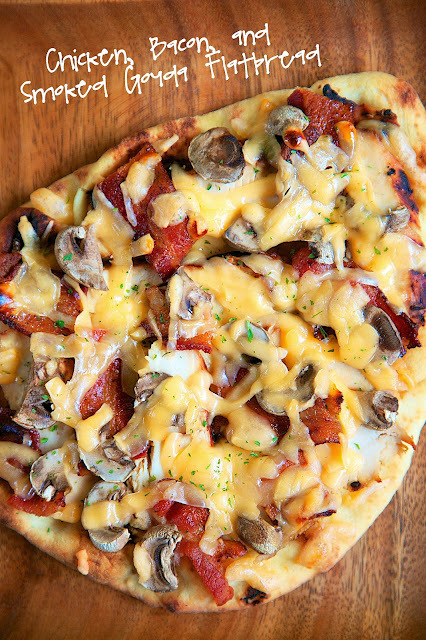 Chicken, Bacon & Smoked Gouda Flatbread Recipe - great way to use up leftover chicken. We sliced up the leftover chicken, added some bacon, mushrooms, smoked gouda and a drizzle of honey. AMAZING and super quick! We are big fans of flatbreads in our house. They are a great way to use up leftovers and they taste delicious. This flatbread came about because we had some extra Roasted Garlic Italian Grilled Chicken and smoked gouda from the Slow Cooker Smoked Gouda Grits. We sliced up the leftover chicken, added some bacon, mushrooms, smoked gouda and a drizzle of honey. The results were amazing. Seriously delicious. We both devoured these flatbreads. The chicken was tasty and we loved the smokiness from the gouda. The honey gives the flatbread a surprising hint of sweetness. We are already planning on making these again this weekend! Place flatbreads on baking sheet. Slice chicken and place on top of flatbreads. 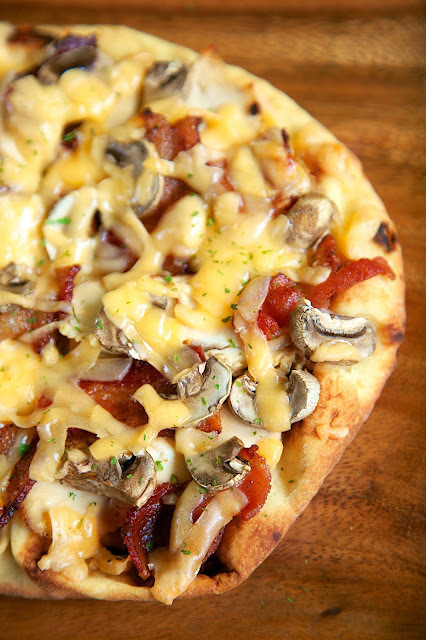 Top with mushrooms and bacon. Sprinkle smoked gouda on top and drizzle with honey. Bake for 10-15 minutes, until cheese is melted and crust is crispy. Flatbread makes such a great summer meal! Love the drizzle of honey! Sometimes leftovers turn into the BEST things, don't they? This looks scrumptious!! I love those naan flatbreads, too, and they are awesomely versatile! Love the toppings you put on this one. Isn't it awesome when a "leftovers" meal turns out to be amazingly delicious? We'd gobble up this version at our house, too! This is on my menu for this week. Can't wait to try it. Could you make this with pizza crust?